We when saw the email about this event -- the "Annual Intercollegiate Iron Pour" at Salem Art Works -- we figured it was referring to something metaphorical/philosophical/post-modern. But, no, it's really about pouring molten metal. This annual event provides a platform for college students across the Northeast and Midwest to come together and cast iron in the context of an intensely focused weekend. 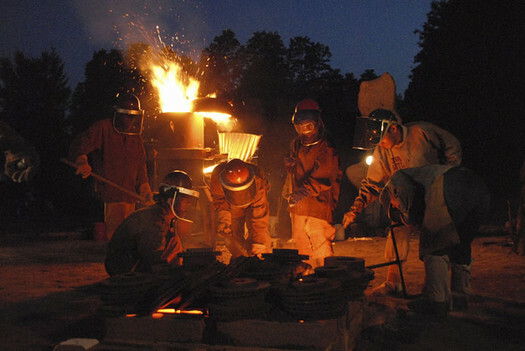 Spectators may observe thousands of pounds of molten iron poured into artists' prepared molds. Visitors can even choose to participate in the iron pour by creating a scratch block: your very own piece of artwork in iron! The event is September 22. It includes a keynote by cast iron artist Matt Wicker on "current trends in cast iron and his thoughts on the future of the medium." SAW's other workshops will also be in action, so you can get an idea of what they have going on there. Salem Art Works is in Washington County (Salem, specifically -- you probably figured that out).